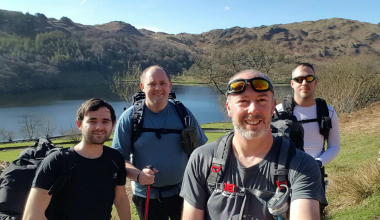 Supporter Syd Cottle (second from left) is among six amateur adventurers teaming up for the Coast to Coast challenge on 17 April. Six adventurers have teamed up for the challenge of a lifetime. They’re preparing to trek over 84 miles in six days along Hadrian’s Wall, carrying all their camping kit, to raise money for causes close to their heart. The idea for their coast-to-coast adventure came about as one of their pals, Phill, wanted to give something back to the charities who supported his brother who has cerebral palsy. Syd Cottle, 46, who is fundraising for us said: "Phill mentioned it to us, and we were all up for the challenge. We wanted to do something inspirational and make our families proud, as well as getting fit and raising money for charity. They don’t under-estimate the physical challenge that lies ahead. “Whilst we all have busy lives most of us have sedentary jobs and are not massive walkers. We’ll each be carrying between 15kg and 25kg each and walking up to 18 miles a day, but we’ve started training and whilst it will be hard for us we're looking forward to the challenge.